Facebook. Twitter. Mybarackobama.com. Text messaging. The President-elect used all of these digital tools to devastating effect in the 2008 election. How did he do it? 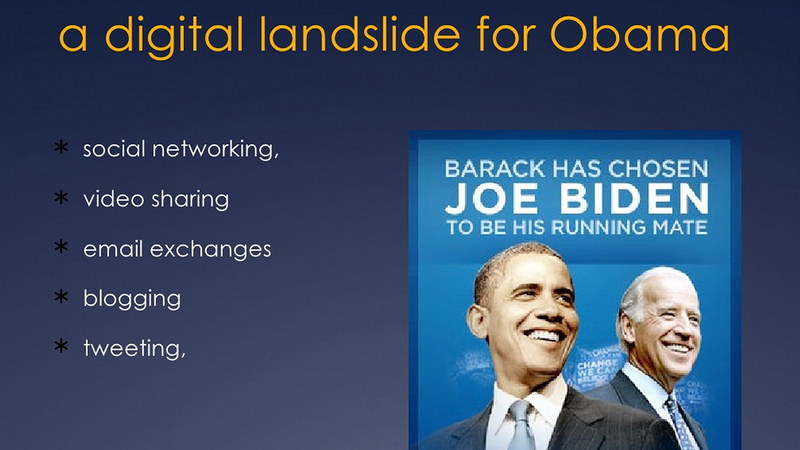 What strategic lessons can we learn from Barack Obama’s high-tech campaign? How might he deploy this online army of millions to govern? And does President Obama’s historic rise to the White House also propel social networking into the mainstream? The answers to these important questions have a profound impact on the very near future of our democracy, as well as how we organize, communicate, and even do business in the digital age. Obama’s campaign manager, David Plouffe, describes it as a convergence between movement politics and business strategy. On the eve of the inauguration, join us for a dynamic, engaging UW Insight conversation that seeks to put this digital revolution in perspective. Program starts at 7:00 p.m., with Q&A throughout. Open to the public, free admission. Professor Lance Bennett, Political Science and Communication, on the digital tools. Kathy Gill, Senior Lecturer, Department of Communication, on social media strategies. Brett Horvath, Social Media Strategist; Pickens Plan, YourRevolution.org, on youth voter registration and the future.